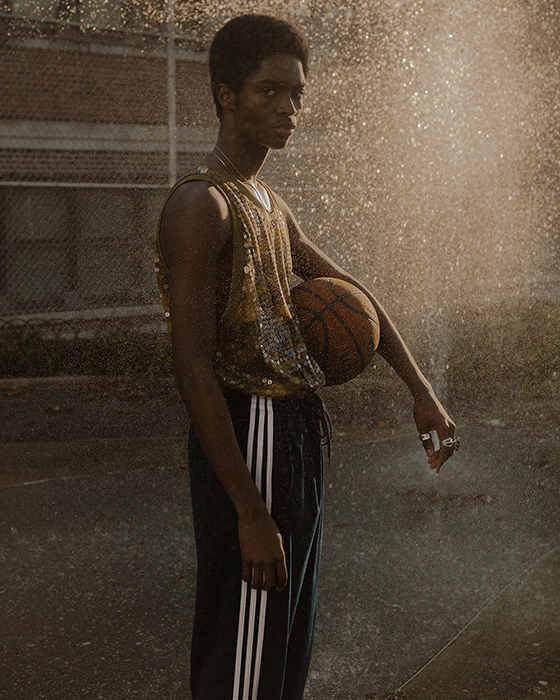 THE FIRST TIME I saw the photography of Brooklyn based artist MICAIAH CARTER in the fall of 2016 at Parsons School of Design…I knew he was going to be successful. A self described recluse, he was not social in college, he just put his head down and quietly got to work. Mentoring and guiding him through his senior year was one of the true joys of my long teaching career. The unique gift that 30 years of experience in the art world and 16 years teaching at one of the most prestigious art schools in the world has given me, is the ability to spot artistic talent and potential - immediately. Micaiah’s portraits are sincere, dignified representations of the sitters while staying true to his distinctive aesthetic - a modern day combination of Roy DeCarava’s poetic, lyrical, emotional photographs - and the proud, regal and formal portraits by Harlem Renaissance photographer, James Van Der Zee - all of them achingly beautiful. Micaiah has been out of school for less than 3 years and in that short amount of time has photographed a distinguished and impressive list of celebrities, athletes, musicians, and artists: Spike Lee, Serena Williams, Taraji P. Henson, Solange Knowles, Kehinde Wiley, Zendaya, Terrence Nance, Jorja Smith, Ciara, Duckie Thot, Dev Hynes, Moses Sumney, and Cortez Kenny IV. Navigating his young career like a seasoned artist, he has worked with: The New York Times, Time Magazine, Warner Bros Records, Epic Records, Nike, Puma, Adidas, Showtime, A24 Films, Pepsi, Converse, Apple, Vice, Afropunk, i-D, Document Journal, Elle, Nylon, Paper, V Magazine and a fashion shoot for designer, Thom Browne . In the next 2 months alone, he will have a 12-page spread in Vanity Fair, photographs in Vogue, and GQ magazines as well as a portrait in the Wall Street Journal, simultaneously. In this day and age, photographers are no longer anonymous, they are celebrities themselves. It is in stark contrast to Michaiah's introverted nature to be front and center, but he's handling this new found success like a pro. One of Micaiah’s many major accomplishments post graduation, was an exhibition at the Brooklyn Museum in February of 2018. An exciting collaboration with the sports brand Adidas, highlighting 7 black creatives who symbolize the future, alongside historical artifacts from the Adidas archive representing the past. Walking into that museum exhibition my heart swelled with immense pride. That moment was confirmation that my first instinct on that fall day in 2016 was correct... MICAIAH CARTER is the one to watch, he is the new generation…watch him rise. SH: Why did you choose photography as your medium? MC : Photography was a way for me to speak without saying anything. I’m usually a timid and reserved person, so photography gave me a chance to get my voice out there without having to say it myself. Also aside from that, I love and appreciate the medium as a whole - the art of capturing a photo still fascinates me to this day. I can remember being a younger kid, begging my parents to let me use their point and shoot for a few frames when we were on family vacations. Photography gave me an outlook on life, not just from my perspective but from the world. I was always curious about looking in archives, whether it’s from my family albums or the albums of other families. SH: What artists do you believe have had the most influence on your work, musical, artistic etc.? MC: I feel like my Dad has had one of the most significant impacts on my work and life, he’s very militant yet very creative, and I think those two things drove my childhood and teenage years in shaping my viewpoint of the world. My parents also made sure that I knew of my history at an early age because they understood that schools did not have a full spectrum of representation within the classroom when it came to curriculum; it wasn’t until I was in my junior year in college that I found out about other black photographers in my past. One of my biggest fashion influences was photographer Koray Birand, I loved his use of toning, and it inspired me as to what I could do with my images. Another significant impact was photographer Philip-Lorca diCorcia, his use of lighting and communication with subjects was stunning to me. Other powers are Carrie Mae Weems and Jamel Shabazz. I also am a massive fan of Ertha Kitt, Aretha Franklin, James Brown, Kelela, Bok Bok, Budige and so many more. Music has impacted my work a lot, I can see a vision when listening to songs. SH: Do you feel growing up in Los Angeles has had an impact on your photographic style? MC: I for sure think that growing up in Southern California impacted the way that I see light in general. I believe that it’s scarce to get that type of light anywhere else, especially New York City, and I think it’s unique to try and pay homage to the desert light which is honestly different from any other light I’ve seen before, in all its glory. SH: You have photographed well known actors, artists, athletes and creatives from Spike Lee, Taraji P. Henson, Kehinde Wiley, Zendaya, Solange Knowles, Terence Nance, Jorja Smith, Ciara, Duckie Thot, Dev Hynes, Moses Sumney, Desus and Mero, Serena Williams , talk about what goes through your mind while you are taking those portraits? Do you ever feel a sense of intimidation? MC : While taking portraits of high profile or celebrities, it comes down to me being down to earth and seeing the human in both of us. I try to be as transparent as possible and not have an overbearing presence because in retrospect I can understand what it is like to be on the other side of the camera and it can make you very nervous at times. I think once I break that initial wall down, we can create something that is fresh and standstill. I never get a sense of intimidation, just more reverence for the people I respect and inspire me the most. SH: You have done a lot in 2 years since your graduation from Parsons School of Design what do you feel motivates your drive and ambition? MC: This goes back to my upbringing when my father would wake me up at five every morning to make sure I made the bus on time and was on top of my school work, and I think that aggressive attitude trickled down to me. I love photography, and I love perfecting my work. I feel like those attributes come out when I am working and drive me to become more creative, push myself harder to tell more transparent stories, and just in general, be humble and in grind mode while I’m blessed to create.